The island of Losinj (Lošinj) is located in the heart of the Kvarner Bay and is a natural bridge between Istria and Dalmatia. Losinj (Lošinj) is an island isolated from the everyday's rush. It is an unconventional blend of cultural and historical traditions, the island of a healthy lifestyle in a quiet and preserved environment. Were he a person, he would be a fan of nature, the sea and the environment, carefree, and devoted to his body and soul. The island of Spa and health characteristics is located on the 45th parallel between the equator and the North Pole, so the largest part of the island is located in subtropical climate. Cres and Losinj (Lošinj) archipelago stretch from the forests of Tramuntana in the north, to the south of Losinj (Lošinj), more precisely, the island Ilovik. Apart from the islands of Losinj (Lošinj) and Cres, the archipelago includes the islands of the Unije, Susak, Male and Vele Srakane and another 36 uninhabited islets. The archipelago abounds with beautiful beaches and coves covered with small round pebbles, clean and clear waters and environment, and the ancient forests that touch the sea. The underwater world is rich in colorful flora and fauna, as well as many mysteriously sunken ships, marble pillars of old villas, antique bas-reliefs. 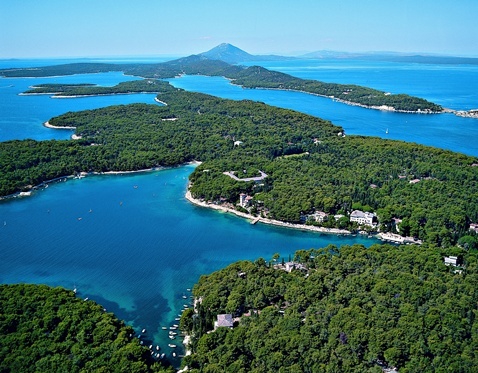 The island of a perfect climate is the second most wooded island that attracts visitors precisely because of its unique health characteristics.